Why should I climb Mt. Everest with IMG? IMG guides are professionals and are great teachers as well as strong climbers. All have done numerous high-altitude expeditions, including the Himalaya. Our clients enjoy the immense benefit of a core group that has climbed together extensively, producing a team that knows how to work well together. We do not think you will find any other Everest climbing or trekking programs that will be led or staffed by persons of the caliber we field. We challenge you to try! 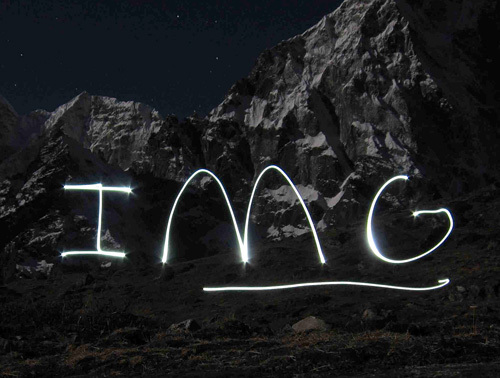 IMG always complies with all local, state, federal, and international regulations for the countries in which we climb. This includes proper visas and climbing permits, full insurance and equipment for our guides and Sherpa support teams, and complete adherence to all environmental regulations. Our clean business record allows us to operate with full liability insurance. All client funds are deposited in a regulated trust account. We take our business seriously! IMG Sherpas are top-notch. We hire the same great Sherpas every year, we treat them with respect, we pay them well and they like working with our teams. 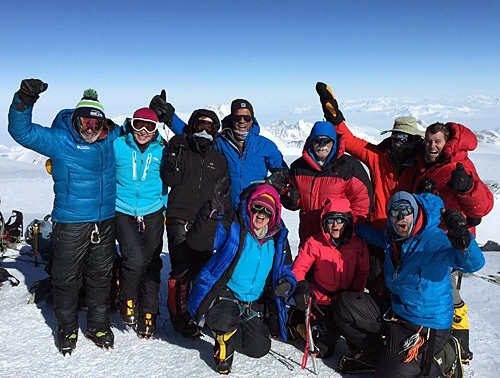 Most of them have been on many climbs with us over the years and many of them have multiple Everest summits. Our enthusiastic cooks do a great job, and our menus are well considered. It makes a difference! IMG trek itineraries are longer than most others offered on the market. We know how to acclimatize properly and we don't rush. Unlike most other teams, we actually take our trekkers to Base Camp and invite them to stay there for several days as members of an expedition team. If you want to trek Nepal to Everest Base Camp, go with a team that actually gives you a real chance to fully experience it! During summit bids, we have Sherpas who carry oxygen to the Balcony and return to the South Col to wait in reserve in case of emergency up high. This is an important safety aspect  having climbers ready at the South Col for support. 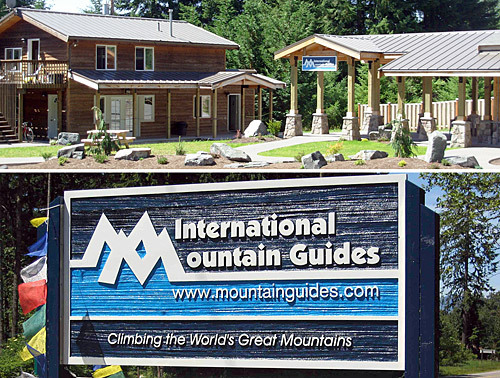 IMG brings advanced technology to the mountain. Solar power at Base Camp quietly supports our satellite communications, allowing us to maintain excellent emergency contact capabilities and keep friends and family informed of our progress during the long weeks away from home. 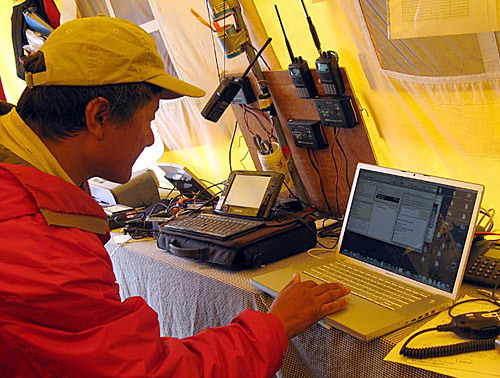 IMG will post regular internet dispatches from all of our teams on our website during the expedition. We require that you be able to pay for your helicopter evacuation, in case you get sick or injured. For this reason, Travel Insurance is required for your program, recommendations are listed here. However, it's important to understand that you may be required to pay for this upfront, and then file a claim for reimbursement. Most insurance companies will require that you be hospitalized or evaluated by a doctor before they will agree to pay. In case your insurance company does not agree to pay upfront for your evacuation you must have available credit on your Visa or MasterCard. (NOTE: credit cards are charged an additional 4% service fee by helicopter companies). Trekkers must have $5,000 available credit and climbers must have $10,000 available credit (the average rescue from EBC runs about $5,000 but if you need to be airlifted from higher than EBC, it will be much more expensive). When purchasing a Travel Insurance policy, Everest and Lhotse Climbers should extend your coverage to include contingency days through June 4 (last possible day of climbing is May 31st) in case you are delayed with your departure from Nepal and need to be covered for some event late in the expedition. C2 and C3 climbers should extend their coverage one week to cover contingency days. Credit cards are charged an additional 4% service fee by helicopter companies in Nepal. In addition to the required Travel Insurance (evacuation/repatriation/medical expense coverage) we strongly recommend that you add Trip Cancellation coverage to your policy to cover cancellation (before the trip starts) or interruption (after trip starts). Note, the "Cancel for any Reason" policies commonly require that you cover ALL your expenses. Climbers, please double check that your policy includes coverage for mountaineering (commonly defined by insurance companies as using ropes and crampons). For more insurance information please see: Trip Cancellation and Travel Insurance. If you need assistance with the various insurance options, contact Becky Kjorvestad in the IMG Office: 360-569-2609 or email becky.kjorvestad@mountainguides.com. Your passport must be valid for 6 months after the trip and have empty pages. Advanced visas are not required for entry into Nepal. We all take care of the necessary paperwork upon our arrival at the airport in Kathmandu. You will be charged approx. $40 (for trekkers) and $100 (for climbers) for the Nepal visa. You will also need a passport photo (2" x 2"). As soon as you get to Kathmandu you will need your visa fee ($100 for climbers, $40 for trekkers) and then at the hotel we will collect your Sherpa tip pool contribution (climbers=$500, Lobuche=$300, trekkers=$200). In addition to the tip pool and visa, I'd suggest $500 more, plus a credit card. You are better to have extra cash money and not need it than to need it and not have it! For your cash, bring new style bills (with the big faces) including some $10's and $20's. You can get a limited number of rupees each day in Kathmandu at a cash machine with your credit card, but you won't get dollars. You can change cash money into rupees at the hotel, and there are numerous money changer shops nearby. NOTE: everybody checks your money for counterfeit and no one takes old bills (bring NEW style US bills, not old style). Merchants will often try to give you ripped bills (rupees) for change. Tell them you want an un-ripped ones, otherwise you'll never be able to spend them. You will probably want to change $100 into rupees (get small bills) to carry on the trek for stopping at the tea houses, shopping in Namche, etc. Climbers who choose to go down to Pheriche for rest and relaxation will need some additional money for this (estimate $35 per day). You will probably want another $100 for spending in Kathmandu for food and gifts. It is difficult to change money once the trek starts. Bring the rest of the money with you in case of emergency. If you have extra left over rupees at the end of the trip that are unspent, change them back before you leave Nepal, otherwise you will not be able to change them once you leave the country. I prefer cash, but you will probably also want to bring a credit card too, but remember that you will likely get hit by your bank with 3% fees on foreign credit card purchases. If you plan to use your credit card you should call your bank and let them know you will be traveling abroad, otherwise using it might trigger a fraud alert on your account which results in your card getting turned off. How does the tip pool work? Ang Jangbu will split up the tip pool among all the different people who work for us: the porters, trek staff, cooks, hotel staff, Kathmandu staff, Base Camp staff, climbing Sherpas, and others that help the team. If you want to give some more to the IMG leaders or the personal Sherpas that climbed with you, that is always appreciated. Transfers between hotel and airport in Kathmandu, double occupancy room at hotel with breakfast in Kathmandu for stated itinerary at beginning of expedition, welcome dinner in Kathmandu for members traveling on published itinerary, helicopter flight to Lukla and fixed wing flight departing Lukla, all group equipment, all meals once trip starts (since appetites are sensitive at high altitude, we suggest climbers bring some favorite high altitude snacks which they like to eat), Park fees and climbing permit fees, liaison officers, Sherpas, camp staff, radio communications, 110v power supply at Base Camp for charging electronics (solar and generator backup), yaks and porters, hyperbaric bag, pulse oximeter, emergency medical oxygen, unlimited medical consultation at the HRA EBC Medical clinic, and unlimited consultation with the IMG leaders. High speed internet is available at Base Camp (price TBD). Trekkers and climbers are provided with a foam trekking mattress for BC. Everest, Lhotse, C2, C3, climbers will be provided a single tent at Base Camp (Trekkers and Lobuche Climbers will have double occupancy accommodations at EBC). 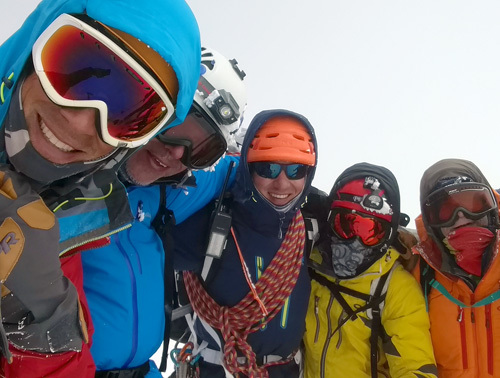 Climbing sherpas will establish the route and camps, carry both team gear and a reasonable amount of your personal member gear (for example your sleeping bag, down suit, high altitude gear can be sent up to C2 with sherpas). Each climber/sherpa team will be provided a handheld radio. 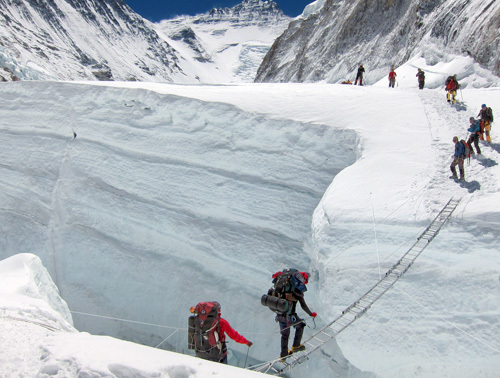 Everest climbers will be provided 7200 liters of climbing oxygen as follows: 1800L at C3, 3600L at Col, 1800L at Balcony. 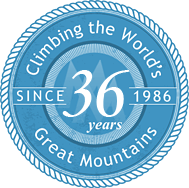 This includes sleeping oxygen at Camp 3 and 4 on the summit bid and oxygen for "practice" at Base Camp prior to the summit bids. Additional oxygen and additional Sherpa support is available for an additional fee but must be arranged and paid for before the expedition. International round-trip air fare and travel expenses to/from Nepal/KTM, meals in Kathmandu, hotels in Kathmandu after the trek/climb, single occupancy room upcharge, personal gear, excess baggage charges, airport taxes and Nepal entry visas, tip pool, internet, satellite phone, personal sundries and beverages, costs incurred as a result of delays or events beyond the control of IMG, required travel rescue insurance coverage and customary but optional tips for sherpas and IMG staff. The equipment list is meant to help you compile your personal gear for a high altitude climbing and trekking trip. Most items are required, while a few are optional. Please consider each item carefully and be sure you understand the function of each piece of equipment before you substitute or delete items from your duffle. Keep in mind that this list has been carefully compiled by Eric Simonson, the expedition organizer. Don't cut corners on the quality of your gear. Avalanche Beacon: We require all Everest/Lhotse/C2/C3 climbers to use a beacon. If you would like to rent an avalanche beacon, we have them for $100 (issued at Everest Base Camp). All meals on the climb and treks are included. You will be responsible for your bottled drinks and alcoholic beverages. You may want to bring powdered drink mixes for flavor in your water bottles. We recommend you bring a modest personal stash of your favorite trail and snack foods. For summit climbers, we recommend that you bring an additional two weeks of personal high altitude snacks (at least 10 pounds) that you know you will be able to eat up high when appetites wane and life is miserable. There is a grocery store in Kathmandu near the hotel which has many snack items available (candy, crackers, nuts, etc). Not available in Kathmandu are things like Power Bars, Gu, or electrolyte replacement drink mix. We usually carry a daypack/rucksack as carry-on luggage and check two lockable bags. One of those bags can stay at the hotel while climbing for storage of your travel clothes (it is OK to leave a bag with wheels at the hotel). The other bag will be used by the porters to carry your gear on the climb, and it should NOT have wheels. It does not have to be 100% waterproof, just stout nylon fabric is fine. You will want to put everything in plastic bags anyway, inside the duffel. We suggest that you use a travel wallet that you can hang around your neck and place inside your shirt. This is a safer way to carry your money and travel documents. Leave expensive jewelry and watches at home. Experienced travelers will also carry a couple of extra passport photos with them as well as a photocopy of the first pages of your passport. These should be carried in a place separate from your passport. Having these available will greatly facilitate the replacement of your passport if you lose it. Carry a pen with you for completing travel forms. Get to the airport early and make sure your luggage gets checked through to the correct destination. How much personal gear of mine will the Sherpas carry to C1, C2, C3, C4? The Sherpas will carry a reasonable amount of your personal gear for you up to the camps. For example  your sleeping bag, down suit, extra high altitude gear, some food and snacks, etc. You should not have to carry a big load at any time on the trip  we want you to be able to move at a reasonable speed. You will need to carry with you the things you require during the day: clothes, snacks, water, camera, etc. Why do I need a second sleeping bag? A second sleeping bag is required for Everest and Lhotse climbers. Your second bag does not have to be super heavy (-10°F), since most climbers will also use their down suit/down gear with the high-altitude bags, to make it warmer and so you are already dressed when you get up. This second bag will stay at Camp 2 between rotations. If you would like to rent a sleeping bag, we have some nice -20°F down bags for rent (@$200). Regarding down parkas  remember, you will probably also leave your down suit (or jacket/pants combo) up at Camp 2 so you will want to have another warm down jacket for Lobuche Base Camp and EBC. Please let us know if you would like to rent a bag before the final payment due date. What if I want to order more oxygen? We can provide additional oxygen which enables climbing @ 4LPM on summit day. Cost is $6000 which gets you an 1800L cylinder delivered at the South Summit. We need to know by the final December payment so we can plan ahead and have sufficient quantity. You cannot order "on the spot"! Is there a way to simulate what an oxygen mask will feel like? The TopOut mask (which we use on Everest) is built on the 3M 6000 series half facepiece respirator body (you can Google that) and doing workouts at home with the 3M mask will simulate some of the issues using oxygen. For climbers familiar with scuba diving, remember the necessity to breathe easy and steady, don't pant, just focus on moving the air efficiently. Check how the mask fits with your goggles. We have found that many climbers will use a Small or Medium size and people with big faces can use a Large size. How do my duffel bags get back to Kathmandu? We will hire porters to carry your duffels back to Lukla, where they will be flown to Kathmandu. What do I do with my passport and plane ticket while I am climbing? We suggest that you leave these items with our staff in Kathmandu, so it is easy for them to change your tickets or extend your visa for you while you are climbing. How does IMG treat their local staff? We take great pride in the long term relationships we have built with our local staff. They do a great job, we pay and tip them well, and they enjoy working for IMG. We make sure that the IMG porters have adequate clothing, equipment, shelter, sleeping arrangements, food, cooking equipment and water. Sick or injured porters are properly cared for. All loads are weighed to ensure that porters are carrying loads that don't exceed their physical ability or legal limits. Porters are paid a fair wage for their work and are paid tip money directly from the tip pool at the end of the expedition (no middleman taking a cut). IMG is committed to Leave No Trace. All human waste is properly disposed of and garbage is sorted into burnable and recyclables (taken back to Kathmandu). All gas cylinders are taken back to Nepal and recycled, and all oxygen cylinders are returned to the USA. No problem, we will organize a porter for you, and you can hike back to Lukla. The porter will carry your duffel bags. We will provide a stipend to cover your lodges and meals on the hike out. Our staff at Lukla will meet you, arrange tickets, and assist you to make the flight to Kathmandu. Rabies: The new vaccine is easy. Kathmandu and Nepal have rabid animals. Malaria: No problem in Kathmandu, since we are above the zone of malaria, but if you plan on traveling to lower elevations in Nepal, or to certain parts of Thailand before/after the trip then malaria chemoprophylaxis is highly recommended. What if a rescue is necessary? Our first priority is always going to be supporting our fellow IMG climbers. We are also willing to assist with other teams that need help with rescue, but this will take second priority to our IMG climbers. Any rescue above Base Camp will require a ground litter evacuation (no helicopter above BC). At and below BC the cost of a helicopter evacuation depends on the type of helicopter involved, the amount of flight time, and the number of landings. The Eurocopter AS350 helicopter costs $2500 per hour (2011 rate) and an evacuation from Everest Base Camp will take at least 3 hours. We REQUIRE that everyone carry a rescue insurance policy that will as a minimum cover $10,000. You will need either cash or a Visa/Mastercard with sufficient credit available (not American Express) since you may need to guarantee the charge on your credit card and then seek reimbursement from your insurance company. What service does the Himalayan Rescue Association (HRA) provide at Base Camp? IMG is a longtime supporter of the work of Dr. Luanne Freer and the HRA staff at the Everest Base Camp Medical Clinic. IMG pays to subscribe all IMG climbers and sherpas to the clinic consultation service with the HRA docs at Everest Base Camp. Certain medications and services are also available for sale by the HRA at the clinic. In addition to the first aid items listed on the equipment list, there are a few additional medications that you should consider. These should be discussed with your personal physician and some will require a prescription. We want everyone to bring two regimens of the antibiotic azithromycin ("Z-Pak") and some Immodium in case of bad traveler's diarrhea. A sleeping medication can be useful for napping on the international flights and for the first few days in Nepal (due to the big time change). We do not recommend the automatic use of Diamox while climbing but you might find a small dose (125mg) useful if altitude sickness symptoms appear. Discuss this and your other medication requirements with your physician. Any medication should be used only if necessary and use should be discussed thoroughly with your physician and with your guide before you take the medication. Water purification is also very important. An effective and inexpensive method is the use of iodine crystals or tablets. These are available commercially at mountaineering stores as a product called 'Polar Pure' or 'Potable Agua'. Filters, such as the ones made by MSR, are also good. Either can be used or both can be used in combination. On the trek our recommendation is to plan on treating your water bottle water with an iodine tablet (Potable Aqua) or other purification method. You can buy bottled water in Kathmandu, but we do not encourage you to buy bottled water on the trek since the bottles are garbage and constitute an environmental issue. If you want to buy boiled water at the lodges for your water bottles, you should bring some extra money. We also recommend that each participant bring a small bottle of a hand disinfectant such as Purell. Anything that we can do to stay healthy is worthwhile. Health issues will be discussed during the expedition and we encourage you to contact us if you have any questions before or during the trip.